the way the upper coolant hose (which gets warm, but not scolding) is routed, the highest part of the coolant system is right in that hose, so im guessing i got an air bubble in there, perhaps somewhere else? Sorry, have to rush this reply. "... the spring side of the thermostat goes into the intake manifold. take the upper hose off and make sure its the right direction.."
FEEL heater water hoses. If the heater water hoses are too hot to hold, the thermostat is OK. If the heater water hoses do not get too hot to hold, check coolant flow to confirm water pump is moving coolant. If ok, replace the thermostat. If only one heater water hose gets hot while the other remains cool, a plugged heater water hose or heater core is indicated. Start vehicle and allow to reach normal operating temperature. Place temperature control knob in the full warm position. Grasp inlet and outlet heater water hoses. 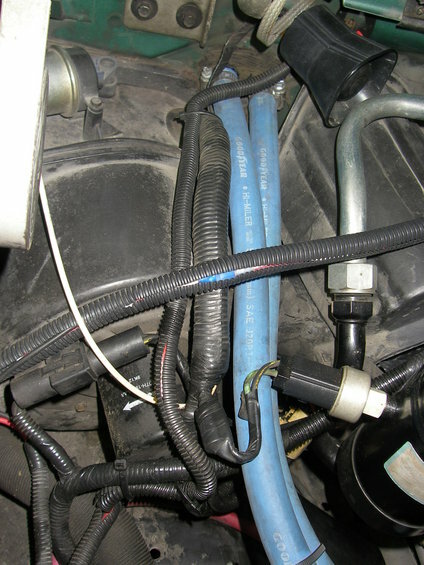 Both heater water hoses should be warm to the touch due to coolant flowing through them. temperature blend door may be stuck closed. 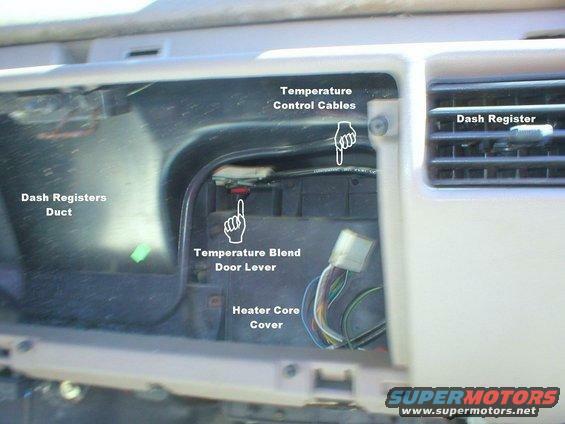 Depending upon its position, the temperature blend door in the heater air plenum chamber directs a given amount of air through the heater core to provide a desired amount of heat. If the amount of air directed by the blend door through the heater core is reduced, less heat will be directed into the passenger compartment. Conversely, a fully open blend door, in response to a fully WARM setting of the temperature control knob, will provide maximum heat into the passenger compartment. ...The diverter door (panel, defrost, floor) is totally independent of the blend door (hot/cold), and it's vacuum-operated, so it'll always be slow; possibly temp blend door is stuck or loose & flopping around on its own. The easiest way to see it is to fully lower the glove box, pull the ~8 screws from the heater core cover, & look inside to the L (driver's side). 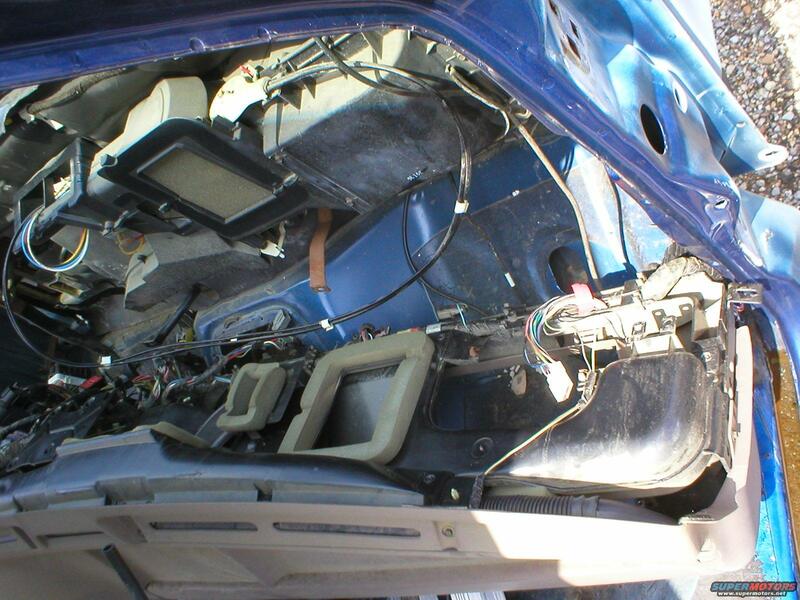 You'll see the cable & control lever (in top L of 2nd pic) as soon as you fold the glovebox down, so inspect it first. "...If all the controls are functioning and you can actually see the cable moving the actuator lever, and you still can't get warm air then most likely your problem is going to be the blend temp door inside the HAVC box. The door is hinged by a piece of flexible plastic, the hinge wears out and breaks then it is not forced into the hot air position by the cable. I found a good one in the junk yard and replaced mine. You have to take most of the dash apart to get to the thing. It takes a while to complete this repair..."
The 3rd shows the whole cover - it's the large section in the top center with tiny white numbers inked near its bottom edge. Low radiator coolant due to coolant leaks. The air handling system is designed to provide defrost when no vacuum is applied to any of the three air door vacuum motors in at least 92-96. This is done to prevent a situation where defrost cannot be obtained due to a system vacuum leak. Instead, a leak in the vacuum control circuit will send all airflow to the defroster outlets. This condition may occur during acceleration (slow leak), may exist at all times (large leak) and may happen only when certain specific functions are selected, indicating a leak in that portion of the circuit. "The air handling system is designed to provide defrost when no vacuum is applied to any of the three air door vacuum motors. This is done to prevent a situation where defrost cannot be obtained due to a system vacuum leak. Instead, a leak in the vacuum control circuit will send all airflow to the defroster outlets. This condition may occur during acceleration (slow leak), may exist at all times (large leak) and may happen only when certain specific functions are selected, indicating a leak in that portion of the circuit. The vacuum hoses used in the passenger compartment control circuit are constructed from PVC plastic material. The vacuum hoses used in the engine compartment are constructed of Hytrel. Because of the materials used, the vacuum hoses should never be pinched off during diagnosis to locate a leak. Use Rotunda Vacuum Tester 014-R1054 or equivalent to locate vacuum leaks. A wood golf tee can be used as a plug when it is necessary to plug one end of a vacuum hose for leak test purposes. " ISSUE: The temperature control knob may be difficult to turn on some vehicles. There may also be a low or no heat/cooling condition accompanied by poor temperature modulation. This may be caused by the single cable temperature door operating system being used. 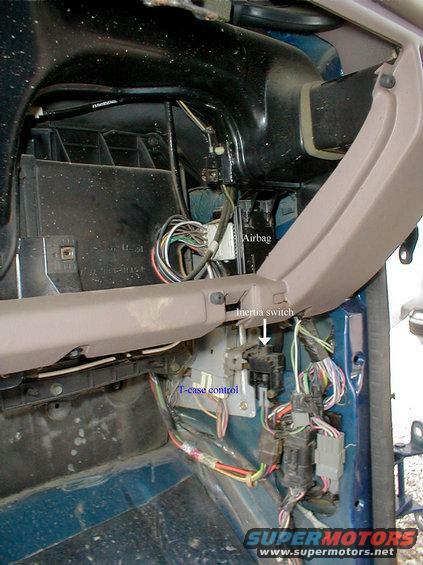 ACTION: Replace the A/C Temperature Control Cable Assembly with a new pull/pull cable design. The new design cable will provide improved control of the temperature door. Refer to the following Diagnostic and Replacement Procedures for details. 1. If the vehicle exhibits high effort turning the temperature control knob or poor temperature modulation, a new cable must be installed. Refer to the Replacement Procedure listed in this article. For a low or no heat/cooling concern, continue on with the Diagnostic Procedure. 2. Check vehicle's coolant for the correct level, concentration and operating temperature with the thermostat open. If a concern is found in one (1) of these areas, refer to the appropriate Service Manual for repair procedures. The repairs must be done before proceeding. 3. Verify proper A/C system charge and operation. Repair as necessary. 4. If the concern still exists, perform the Cable Adjustment procedure listed in the appropriate F-Series/Bronco Service Manual, Section 12. 5. If the concern still exists, replace the temperature door cable. Refer to the following Replacement Procedure for details. 1. Remove glove compartment and module assembly, if present. 2. Detach cable from plenum using Tool D91T-18532-A. Remove and discard cable. 3. At the cable bracket on the plenum heater core cover, cut away the bracket using a hacksaw blade or similar tool. 4. Remove the 5/16" headed screw from the top of the cam. Discard the cam and screw with spring clip. 5. At cam post, add post extension and secure with the new screw, torquing the screw to 1.7 N-m (15 lb-in). 6. Remove the upper left screw securing the plenum heater core cover and install the A/C plenum chamber support bracket between the ribs to the right side of the bracket which was cut off. Make sure the hole from the previously removed screw is lined up with the hole in the plenum chamber support bracket. 1. At the plenum chamber, move the temperature door arm to the "full warm" position (counterclockwise) and be sure it remains there throughout the installation procedure. 2. At the small end of the cable (control head), remove the temperature control bracket from the cable by releasing the three (3) snaps using Tool T94P-18532-A or a thin blade screwdriver to allow the cable to be pushed back through the instrument panel toward the control head. 3. Be sure the new pull/pull cable is in the "full warm" position. Check the molded-in arrow at the control head portion of the cable. Normally the cable is shipped in the "full warm" position. 4. At the plenum, position the cam end of the cable over the post. Make sure the temperature door arm can move into the slot of the cam and push down until the cam is engaged on the post. An audible click can be heard. If it is necessary to remove the cam cable head, use moderate finger pressure on the plastic tab at the top of the cam cable head, moving it back so the cam may be pulled out off the post. 5. Place the twin cables in the center slots of the A/C plenum chamber support bracket. If adjustment is needed later, the cables can be moved to the other adjacent slots. 6. Route new cable through the instrument panel following the same path as the old cable. 7. Check the new temperature control bracket to be sure it is in the "full warm" position. The tab should be in the slot in the bracket. 8. Push the temperature control bracket onto the control assembly and turn it to catch under the retaining tab. Secure with the new screw previously saved. 9. Place the knob on the temperature control. 10. Push the cable head onto the temperature control bracket (make sure gear pilot centering hole is lined up correctly) until the three (3) lock into position (you should hear a click of three (3) tabs). 11. Install temperature control assembly in instrument panel. 12. Swiftly rotate temperature control knob to each extreme (cool-warm) and listen for the sound of the temperature door closing in both directions. If no audible close is heard, move the cable into different slots at the A/C plenum chamber support bracket covered in Step 4 of the Installation Procedure until there is an audible close in each direction. 13. Bring vehicle to operating temperature and verify proper heating and cooling by measuring the temperature of the discharge air at the outlets. 14. At A/C plenum chamber support bracket, secure cable to bracket with a tie strap to keep cable in place. Obtain an Authorized Modifications Decal and list the date, dealer number, and summary of alterations performed. Select a prominent place adjacent to the Vehicle Emission Control Information Decal suitable for installing the Authorized Modifications Decal. Clean the area, install the decal, and cover it with a clear plastic decal shield. 1. Fill the radiator with a 50/50 mixture of the specified engine coolant concentrate and water. Allow several minutes for trapped air to escape (bubble out) and for engine coolant to flow through the radiator. 2. Replace the radiator cap to its fully installed position, then back off to the first stop. This will prevent high pressure from building up in the cooling system during this part of the fill procedure. 3. Start and idle the engine until the thermostat opens and the radiator upper hose becomes warm. 4. Shut off the engine and allow the engine to cool. Cover the radiator cap with a thick cloth and cautiously remove it. Step back while the pressure releases. 5. Finally, check the radiator and add more engine coolant if needed, following the procedures noted above. Reinstall the radiator cap securely, when finished. 6. If more engine coolant is necessary, fill the overflow reservoir to the appropriate level marked on the bottle..."
Install the water thermostat in the intake manifold opening with the copper pellet or element toward the engine (6007) and the thermostat flange positioned in the recess. If the water thermostat is improperly installed, it will cause a retarded flow of coolant.